, the Street View mascot, below the map so I click on the first one. This instantly takes me to an immersive 360-degree interior view of the restaurant, as if I were virtually teleported to Redbones. 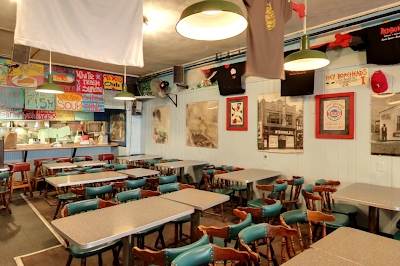 I pan around and see that it's a cool colorful restaurant with a nice, comfy feel. 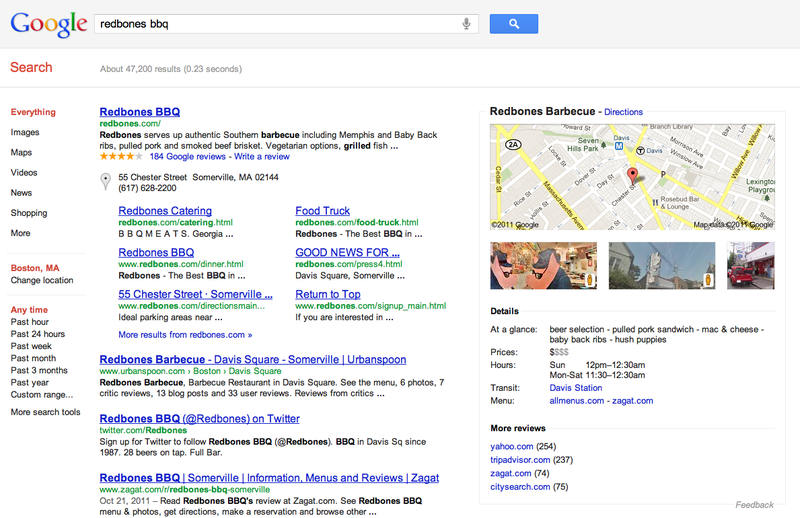 What's more, when I go back to the search results panel and click on the second image, I’m able to look around the outside of the restaurant and get a sense for the neighborhood via the familiar Street View experience. I’m beginning to really like this place! Further down the panel, I see the price range indicating it won’t be too expensive and an “at a glance” summary that tells me Redbones has great beer and pulled pork sandwiches -- and menu links if I want to see more. Thanks to this helpful information right on the search results page, I’ve quickly been able to make my decision: I’m going to Redbones for a pulled pork sandwich. Even if I’m not looking for a particular place by name, I can learn about places and quickly decide which ones are right for me. 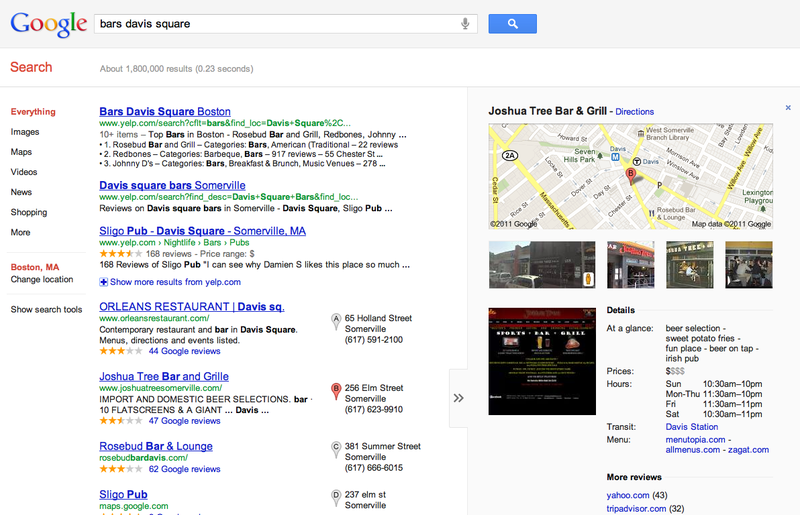 If I want to find a bar near Redbones for a few drinks after dinner, I can just search for [bars davis square] and get a familiar list of results. Only now, scanning the list and comparing places is easier than ever, since the instant preview feature will show the same detailed information about the various bars when I hover over the “>>” symbol to the right of each result. After just a few seconds perusing the additional local information for different places, I know that Joshua Tree has a great beer selection and that the Orleans has live music but is a bit farther away. This new type of layout may appear on the search results page for a range of real-world places -- restaurants, hotels, local businesses, landmarks, museums and more. Of course, the local information that appears will vary depending on what’s available online. So the next time you plan your visit to the New England Aquarium or Fenway Park, you might be able to check out their opening hours, get directions, and find the nearest transit stops, all from a simple Google search. In the coming weeks, you’ll start seeing the improved local search experience in more than 40 languages. Give it a try and start discovering new local favorites, near and far! I love eating out with my friends and trying new places, but one of the most difficult questions you can ask me is "Where do you want to eat?" Today, we’re making a few improvements to Google search that will make it a lot easier and faster to answer this question. For example, I mentioned to a friend that I’ll be visiting Boston, and he suggested that I check out a barbecue place called Redbones BBQ in Davis Square. 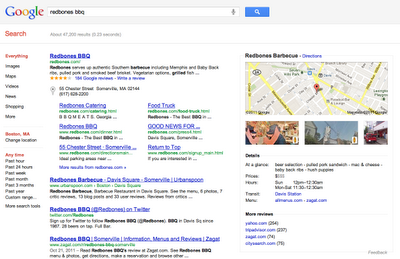 Since I don't know that restaurant, I do a quick search for [redbones bbq] to see if it’s a place I’d like. When I do, I see the same familiar search results page but I notice that there's now a new panel to the right of the results -- where previously only a map appeared -- with much more information than before. I see two images with pegman, the Street View mascot, below the map so I click on the first one. This instantly takes me to an immersive 360-degree interior view of the restaurant, as if I were virtually teleported to Redbones.